Gintama is probably my favorite anime of all time. It’s hilarious, clever, creative and action packed. If that’s the type of show you like, watch a few episodes and you’ll be hooked! So, when I found out there’d be a live show at USJ, we were there in line waiting for the very last show of the year. It was risky to try and come back since there was limited space, so we ended up waiting in line for 3.5 hours. The line moved about once an hour. My friends didn’t know what it was and didn’t watch Gintama, but they were up for the adventure. I had no idea what to expect and how they were going to execute a Live Gintama show. There a lot of Gintama fans waiting in line with us. Some groups of friends coordinated to dress as characters from the anime. Those costumes were good. Some seemed even better than what they used on the Gintama Live Action Movie. Once we got into the attraction, it was another large stage with lots of seats. Most of the seats filled up again. The stage looked like it came right out of the Gintama anime. An announcer came out and began talking to the audience. This went on for some time then I realized this was the show. Once again, this was entirely in Japanese. The announcer was talking to the crowd and asking them how much they love Gintama and who their favorite characters were. Then there was a pre-determined response from the Gintama anime voice that awarded them a prize to their response. Some were hilarious. Overall, it was too difficult to understand what was happening since most of the jokes were dialog based instead of visual. It was still fun, but wouldn’t have waited 3.5 hours for it. BTW: The Live-Action Gintama movie was bad. But that’s probably because I’m used to seeing Marvel level special effects. To get to that level, you’d need a high budget. 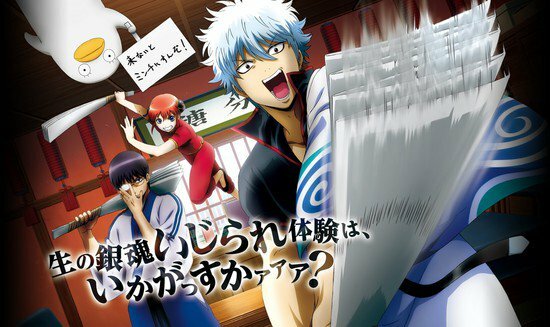 The movie was promoted with the return of the anime series, a special USJ attraction and a special Gintama art showcase at Huis Ten Bosch.